LOS ANGELES >> A Pasadena man who was allegedly drunk and on probation for a previous DUI conviction when he rear-ended a car on the 110 Freeway in Elysian Park, killing an infant who was riding as a passenger, has been charged with murder, authorities said. Prosecutors on Tuesday filed a charges of murder, DUI causing injury or death and driving with a blood-alcohol level above .08 percent against 26-year-old Jared Hale Lynch Silvestri of Pasadena in connection with Saturday evening’s crash on the northbound 110 Freeway near Stadium Way, Los Angeles County District Attorney’s Office spokesman Ricardo Santiago said. An arraignment hearing scheduled Tuesday afternoon in Los Angeles County Superior Court was postponed until Dec. 15, he said. Four-month-old Melanie Brown of Carson, who was riding as a passenger in a car driven by her grandmother, died at a hospital following the crash, according to California Highway Patrol officials and prosecutors. The grandmother and another 9-year-old granddaughter who was also riding as a passenger were hurt. The 48-year-old La Crescenta woman was pulling her Chrysler over to the right shoulder when Silvestri approached from behind in a Volkswagen Jetta and slammed into the slow-moving Chrysler at “a high rate of speed”, CHP officials said in a written statement. A third car became involved in the collision, but the driver was unhurt, according to the CHP. Paramedics tool the injured grandmother and her two granddaughters were taken to Los Angeles County-USC Medical Center, where the infant girl succumbed to her injuries several hours later. Silvestri was initially booked on suspicion of drunken driving following the crash, according to the CHP. But after the young victim died, and it was determined that Silvestri has been convicted of DUI in another case eight months ago, prosecutors ultimately charged the defendant with murder. Those convicted of DUI are generally issued what’s known as a Watson advisory upon sentencing. By signing the advisory, the convict is acknowledging that DUI is extremely dangerous to human life, and that if someone is killed as result of the convict’s DUI, prosecutors may file a murder charge. Silvestri received just such a Watson advisory earlier this year, when he was convicted of misdemeanor DUI in March in a separate case, Santiago said. He pleaded “no contest” to a count of driving with a blood-alcohol level greater than .08 percent in Pasadena Superior Court in March, Los Angeles County Superior Court. A second charge of driving under the influence of an alcoholic beverage was dismissed. Silvestri was sentenced to three years of summary probation,fined $390 and ordered to attend a three-month substance abuse counseling program. If convicted as charged in the new case, Silvestri could face up to 25 years to life in state prison. According to county booking records, Silvestri was being held in lieu of $2 million bail. ANGELES NATIONAL FOREST >> Coroner’s officials Wednesday confirmed that skeletal remains found near an overgrown SUV crash scene in the Angeles National Forest near Mt. Wilson last week are those of a 47-year-old Sunland woman who went missing more than two years ago. Kimberly Ann Blum, 47, was last seen on June 5, 2014, after leaving her sister’s home in La Crescenta, according to Los Angeles police investigators and her mother, Rosalie Blum. After more than two years with no answers as to the circumstances of her disappearance, authorities discovered Blum’s Honda CRV SUV on Aug. 24, more than 500 feet over the side of Angeles Crest Highway, near mile marker 41.69, Lt. Steve Jauch of the Los Angeles County sheriff’s Homicide Bureau said. Skeletal remains were found near the SUV, which was being overgrown with weeds and foliage, the lieutenant said. But the remains remained officially unidentified due to the condition of the remains. Coroner’s investigators determined through dental record comparison that the person found dead at the apparent crash scene was, in fact, Kimberly Blum, Los Angeles County Department of Medical Examiner-Coroner Chief of Operations Brian Elias said. Blum’s cause of death remained under investigation, Elias said. ANGELES NATIONAL FOREST >> A crashed and overgrown SUV found near a set of skeletal remains deep in the Angeles National Forest near Mt. Wilson has been connected to a Sunland woman who disappeared just over two years ago after leaving her sister’s home in La Crescenta, authorities said Thursday. The silver Honda CRV was discovered Tuesday, more than 500 feet over the side of Angeles Crest Highway, near mile marker 41.69, Los Angeles County sheriff’s officials said. The SUV was becoming overgrown with weeds and foliage. Searchers returned to the apparent crash scene Wednesday morning, where they discovered the skeletal remains of an unidentified person, Lt. Steve Jauch of the sheriff’s Homicide Bureau said. The age or gender of the person whose remains were found was not clear. Jauch declined to speculate on how long the SUV and remains had been there. The Honda has been “connected” to Kimberly Blum, who was reported missing by her family on June 5, 2014, at age 45, Deputy Trina Schrader of the sheriff’s Information Bureau said in a written statement. Blum briefly stopped by her sister’s house in the 2000 block of Cinco Casitas Lane in La Crescenta, where a graduation party was being held for her niece, her mother, Rosalie Blum, said last year. Surveillance camera footage shows Blum walking away from her sister’s home and driving off in a silver Honda CRV. The only sign of Blum was a small bag containing medication and other personal items belonging to her that was found along the side of Angeles Crest Highway, 21 miles north of the 210 Freeway, in the early days of the search for her. Anyone with information was asked to contact LAPD Detective Cletus Carlton at 213-996-1800. LA CRESCENTA >> Coroner’s investigators have determined that a an elderly La Crescenta man found dead at his home last week was beaten to death, and the case was ruled a homicide. Arthur Palmer, 73, was found dead about 1:30 p.m. on July 24 inside the attached garage of his home in the 3000 block of Frances Avenue, Los Angeles County sheriff’s officials said. An autopsy determined he died from “multiple blunt force traumatic injuries,” Lt. Kelly Yagerliner said. The death was ruled a homicide. LA CRESCENTA >> The death of an elderly man found dead with serious head injuries in his La Crescenta home Friday is being investigated as a homicide, sheriff’s officials said. “The victim is a male White in his 70’s who died of apparent blunt force trauma,” Deputy Trina Schrader of the Sheriff’s Information Bureau said in a written statement. No further details were released. It was unclear whether an intruder had forced entry into the home, or whether anything had been stolen. Los Angeles County Department of Coroner officials withheld the victim’s name Saturday pending notification of his family, coroner Investigator Mario Sainz said. It was not clear how long the man had been dead before his body was discovered. LA CRESCENTA >> Homicide detectives are investigating the death of an elderly man Friday in a La Crescenta home. Few details were initially available regarding the investigation, which began about 1:30 p.m. in the 3000 block of Frances Avenue. Detectives responded the scene, “to investigate the circumstances surrounding the suspicious death of a man,” Deputy Sara Rodriguez of the Sheriff’s Information Bureau said in a written statement. Deputies first responded to the home after a local resident asked them to “check the welfare” of a neighbor, who had not been seen for several days, Lt. Mohrhoff of the sheriff’s Crescenta Valley Station said. After discovering the body of a man inside the home, deputies summoned their counterparts in the Sheriff’s Homicide Bureau to take over the investigation, Mohrhoff said. The man, who was in his 70s, appeared to have suffered “blunt force trauma,” according to deputy Trina Schrader. “The identity of the victim and the cause of death will be determined by the coroner,” Schrader said. No further information was released. Anyone with information was asked to contact the Sheriff’s Homicide Bureau at 323-890-5500. Tips may also be submitted anonymously to Los Angeles Regional Crime Stoppers at 800-222-8477. Friday marks one year since a Sunland woman mysteriously disappeared after leaving a family gathering in La Crescenta, and family members have renewed a $5,000 reward for information leading to her as they continue seeking answers and maintaining hope that she’ll be found safe. Kimberly Blum, 45, vanished June 5, 2014, after leaving a graduation party for her niece at her sister’s home in the 200 block of Cinco Casitas Lane, according to Los Angeles police officials and family members. Compounding the pain of missing her daughter is the mystery surrounding what happened to her, said her mother, Rosalie Blum. Kim Blum’s car was never found, and her bank accounts and credit cards have not been used since her disappearance, Detective Cletus Carlton of the LAPD’s Adult Missing Persons Unit said. “It’s like she just disappeared completely,” the detective said. The only physical trace left behind was a small bag containing medication and other personal items belonging to Kim Blum found along the side of Angeles Crest Highway, 21 miles north of the 210 Freeway, in the early days of the search. Nothing has been seen or heard of her since, Carlton said. “We have no new leads.”. Blum had a cell phone with her when she disappeared, but it was last detected near her sister’s home, Rosalie Blum said. Carlton said police were working with search and rescue officials and volunteers to organize another search of the area of the Angeles National Forest where Kim Blum’s belonging’s were discovered. Plans for the upcoming search were yet to be finalized, but the family hoped to organize the effort to seek clues around the time of Blum’s 46th birthday on June 30. Rosalie Blum said after all this time without any sign of her daughter, she wondered if Kim Blum may have disappeared somewhere other than the forest. “We do know that she had a full tank of gas,” she said. “They’ve been up there twice with search helicopters. Friends even hired a helicopter and went up to look,” Rosalie Blum said. “That whole summer, we were up there putting up fliers and posters, and just everything everybody could think of,” she said. And with a year of hikers and campers traversing the forest, the mother said she found it odd that no additional signs of Kim Blum have turned up. Family members remained baffled, Rosalie Blum said. “It’s a total, total, disappearance. Even her car,” the mother said. There was no indication that Kim Blum wanted to be missing, according to her family and police. She was expecting a friend to visit the following day, and had been making appointments at her personal organizer business, her mother said. And she left behind a beloved pet dog. Her missing vehicle is a 2004 Honda CRV SUV with California license plate 5JVU774. Anyone with information is asked to contact Detective Carlton at 213-996-1800. The family has set up a website dedicated to the search for Kim Blum at www.findkim.com. Police and worried family members are asking the public’s help in finding a Sunland woman who mysteriously vanished four weeks ago after stopping by her sister’s home in La Crescenta. Kimberly Ann Blum, 44, was last seen the afternoon of June 5 as she left her sister’s home in the 2000 block of Cinco Casitas Lane in La Crescenta, according to family members and Los Angeles police officials. After briefly stopping by the house, where a graduation party was planned for her niece, Blum, suddenly left, her mother Rosalie Blum said. A bag containing some of Kim Blum’s belongings, including medication, was found along Angeles Crest Highway in the Angeles National Forest, about 21 miles north of the 210 Freeway, according to police and family members. And despite extensive searches of the area, Kim Blum’s silver, 2004 honda CRV SUV with California license plate 5JVU774, remains missing, officials said. Finding the SUV may be the key to finding out what happened to Kim Blum, Carlton said. Police, aided by a Los Angeles County Sheriff’s Department helicopter and the Montrose Search and Rescue Team have searched the area where the Kim Blum’s bag was found multiple times since her disappearance, finding no other clues into her whereabouts, Carlton said. Family members even hired a private helicopter to conduct a search, with no success, Rosalie Blum said. “It’s really, really treacherous terrain up there,” she added. 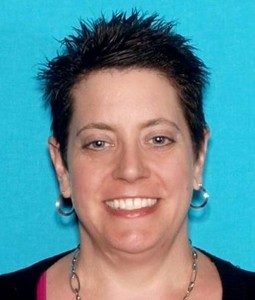 Kim Blum’ credit cards and bank accounts have not been accessed since her disappearance, police and family members said. “And she didn’t have much cash on her, from what we know,” the mother said. “She did have a cell phone, a smart phone, but the last ping was at a tower near her sister’s house, so we don’t know whether she turned it off. There hasn’t been anything from that,” Rosalie Blum said. Rosalie Blum said her daughter has never gone missing before and had been busy making plans at the time of her disappearance. A friend was scheduled to arrive in town to stay with Kim Blum June 6, Rosalie Blum said. Kim Blum had also made several appointments to meet with clients of her personal organizer business. Rosalie Blum said she also couldn’t imagine her daughter voluntarily leaving behind her beloved dog, Sadie. The mother said she planned to head up into the forest again Thursday to pass out fliers with pictures of Kim Blum as far north as Wrightwood. “You always want to be hopeful,” Rosalie Blum said. The worried mother asked those who will be recreating in the forest this Independence Day weekend to keep an eye out for Kim Blum or her SUV. Kim Blum, a graduate of La Canada high School and the University of Redlands, is described as white, 5 feet 2 inches tall, 144 pounds, with brown hair and blue eyes. She was last seen wearing a black tank top, and she also wears prescription glasses. Anyone with information was asked to contact Detective Carlton at 213-996-1800. PHOTO of Kim Blum courtesy of the Los Angeles Police Department. LA CRESCENTA — Two burglars made off with an unknown amount of prescription drugs in an overnight burglary at a Walgreens Pharmacy, authorities said. Deputies responded to a burglary alarm about 3 a.m. Saturday at the store, 3001 Foothill Blvd., but the burglars had already fled, Los Angeles County sheriff’s Sgt. Randy Tuinstra said. The two burglars, initially described only as male, smashed the front window of the business to get in, then helped themselves to the pharmaceuticals, the sergeant said. The type and amount of drugs stolen were not clear Saturday, he added. Tuinstra said detectives were going over video surveillance footage in hopes of developing a description of the burglars. 2411 Montrose Avenue, Montrose 91020. The shelter will open at 6:00 p.m.
during the entire rain event and vehicles will be subject to towing. Residents are urged to continue to monitor news broadcasts, or visit the CARE website at www.dpwcare.org for further updates as this series of storms approach.